A ridge of pressure has been gradually moving in today, with a period of very high activity expected by tomorrow morning. A local alert has been issued for rising panic and possible strong exasperation. The long range outlook is for calmer conditions and a 3rd birthday cake in the shape of a castle. I can't even imagine trying to ice THAT!! Good luck and have a great party!! Oh WOW! Where did you get that? I know a soon-to-be 8 boy who would think that's the ants pants! Oh. My. I can raise my eyebrows from high on my pedestal (only because I don't have to worry about another birthday cake till mid March) Meanwhile I will wallow in denial. Those tins are heavy, huh? We have the caterpillar on and despite all the fiddly edges the cake came out brilliantly. There is a lot to be said for old-fashioned metal over groovey modern silicone. I love those nordicware pans. I want the one shaped like a beehive. Goodlcuk with the cake. I'm sure it'll turn out great! You are so right. The storm before a small one's birthday party is huge! I love the tin. Please post a picture of the finished cake!! Where did you find the tin? Ace cake tin. Good luck and Best Wishes for a fabulous Birthday cake and party. I'm cheering for you HB. I know you can pull it off. I have to admit, I'm a little scared looking at that tin. Good luck, may the baking force be with you. 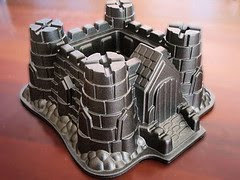 Oh my goodness - you really are going to make a castle cake! How on earth do you get it to cook evenly when it's such a strange shape? For anyone who likes the look of this cake tin, the brand is "Nordicware". Its a very solid 10 cup bundt pan, made from non-stick cast iron. When you follow the instructions, the cake just drops out of the pan with all the detail. Its amazing! Nordicware also do an array of other fantastic shapes. I received mine as a gift, but I know they are readily available in stores and online. The Nordicware website gives both retailers and distributors.